After making the baby three different sized hats and two lots of matching booties, I was searching Ravelry to decide what to create next. I also had several small balls of yarn that needed using up – so I opted for a simple baby blanket that I could sit back and work on while attempting to find something interesting to watch on TV. 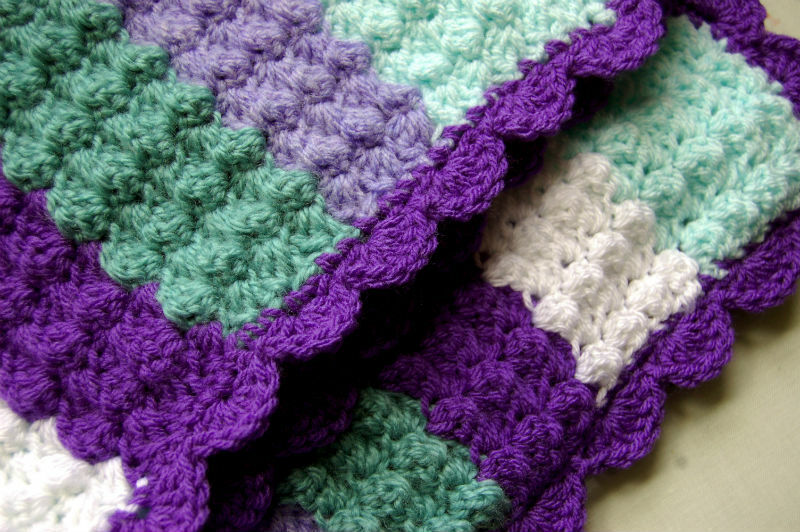 The pattern is loosely based on one double crochet and two trebles into one stitch. I worked with a variety of complimentary colours in double knitting, using a 5mm hook, so the work grew quickly. The finished object took me a week to complete, including adding a pretty shell stitch border in purple, made with six trebles into one chain, with slip-stitches in the middle. 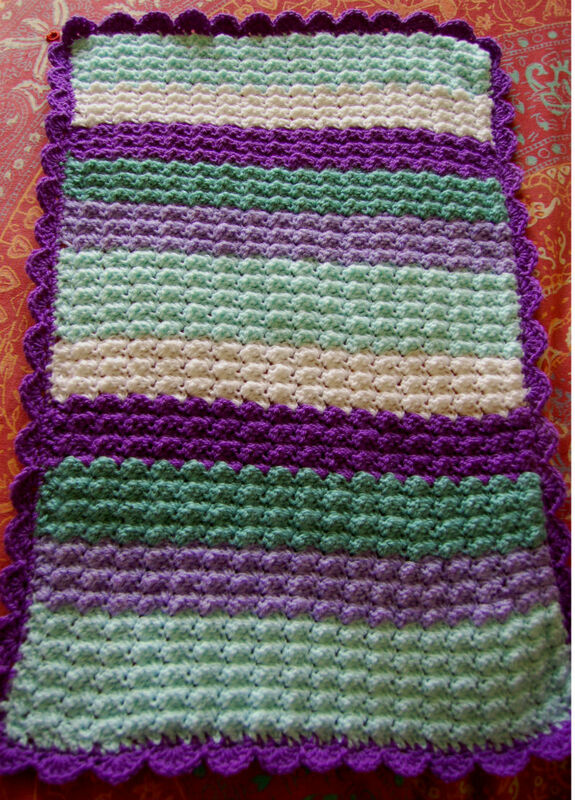 My baby blanket is loosely based on a pattern I found on Crochet Pattern Central – Bubbles Baby Blanket – by Deneen St Amour – so thank you to her for the inspiration. Scroll to the bottom to see an updated pic! I thought I’d also share with you the second newborn crochet hat and booties I made over the May bank holiday. 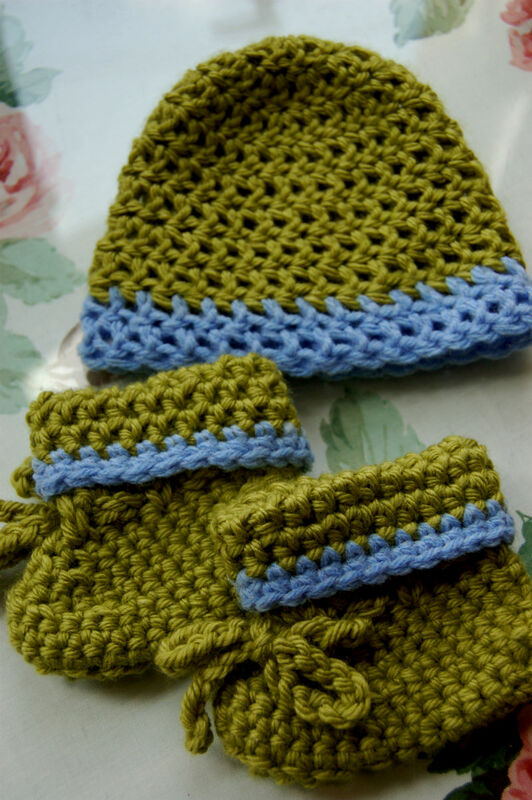 If you’d like the patterns click here for the hat and here for the booties. See my previous post Things to make on a rainy bank holiday to read more about them. 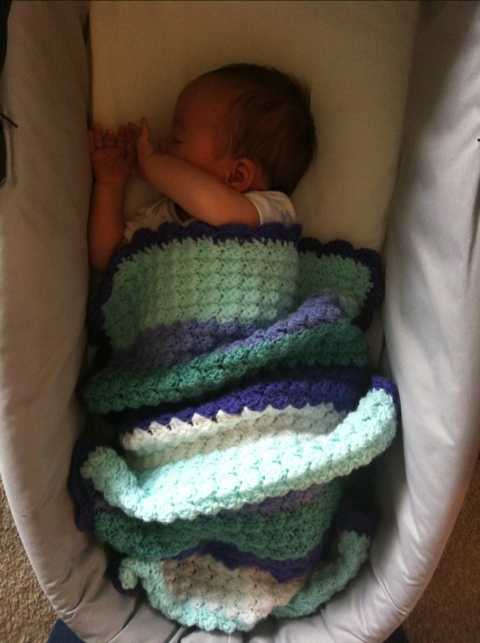 August 2012: the blanket in action with baby Iolo! This entry was posted in Crochet, Crochet and knitting for babies, Pregnancy & Childbirth and tagged booties, crochet baby blanket, crochet newborn hat by Great Green Kitchen, Womankind Yoga, SUP Yoga Swansea. Bookmark the permalink. I ‘m new at crocheting and I thank you very much! Hoping for more Grandkids! Hope you enjoy making it. My little boy loves his crochet blankets!